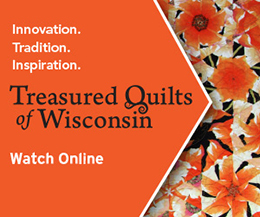 Wisconsin Public Television and Nancy Zieman Productions invite you to join us in the Wisconsin Public Television studios—the location of the Sewing With Nancy set—for an open house: Celebrating Nancy Zieman. Nancy Zieman, longtime host of Sewing With Nancy and co-founder of Quilt Expo, passed away on Nov. 14, 2017. An educator, author, pattern maker, television producer, entrepreneur and innovator, Nancy inspired millions of sewing and quilting enthusiasts throughout her career. She hosted Sewing With Nancy, the longest-running sewing series on television, since 1982. Please join us on Dec. 16 from 9 a.m. to noon in the WPT studios for the Celebrating Nancy Zieman event in honor of Nancy’s life and legacy. View the Sewing With Nancy set*, get a behind-the-scenes look at the production of Sewing With Nancy, view a tribute video and visit with the production staff who worked with Nancy over the years. You will also be invited to share your memories of Nancy—and how she inspired you—in a feedback booth. This free celebration in honor of Nancy is an open-house format: Please feel free to arrive and leave at any time. Coffee and light fare will be served. RSPVs are requested but not required. If you are able, please RSVP by clicking here. The WPT studios are located on the second floor of Vilas Hall. Enter down the stairs next to the loading dock entrance on the Park Street side of the building. Volunteers will be on hand to point you in the right direction. Please allow extra time for traveling and parking. Content in this feed is © copyright 2017 by Nancy Zieman Productions, LLC and may not be republished without written permission. You’re welcome to forward the email to a friend or colleague but it’s not okay to add the RSS feed automatically as content on a blog or other website. The chenille scarf caught my eye and also the lettuce edged scarf. I have learned so much from Nancy – so glad her legacy will live on. I’m loving the Spiral Scarf. I would love to go to your Open House to celebrate Nancy. She was an inspiration to me and got me back into sewing. Unfortunately I live too far away to attend but I’m sure there will be a lot of Fans there. I have been very intirgued by the chennille scarf since I first saw it. I lost the handwritten directions I had and then I couldn’t remember what it was called. Eureka! Here it is! I would really like to try my hand at making a scarf. My daughter wears them a lot. It would be nice to surprise her with one. LOVE!!! I’m a big fan of scarves. I might have an entire corner of my closet devoted to them. This is a great round up! I feel like scarves may be something I could easily make for myself. I can’t wait to try out one of these tutorials! Dear Nancy, I have been inspired by you & your programs for years. The infinity scarf is what I would like to make. With 6 children, 10 grandchildren, 2 great grandchildren , and the rest of the family, I always have someone to sew for. Your programs give me ideas for all. Thanks again. I would love to make the Bejewled scarf, such a unique idea. Thank you to the Sewing with Nancy team for continuing her legacy. I’d like to sew a cowl infinity scarf. I’d like to try the scarf that has a pendant hanging from the center front. All-bias spiral scarf is a fun one to make, too, especially with a striped fabric. Still in shock about Nancy. . .
One year for Christmas every lady on my list got an infinity and/or a spiral scarf. I guess this year in tribute to Nancy it’s time to again update their wardrobes with new ones in new colors, and for me to get a chenille scarf. I’m just getting back to garment sewing and would love to add some lovely scarves. Fleece scarf. I have never made a fleece scarf before. I’ve been wanting to make a chenille scarf for ages, just never got around to it. Maybe now’s the time. Definitely Infinity scarves!!!! They will be in flannel for all the gals in my family that live in Buffalo! Warm is the key here! Thank you for the patterns and opportunity to win Nancy’s book! I think the first scarf I’d make would be the chenille scarf. Or, because I like the idea of a pocket scarf for the winter, I love the mitten scarf a lot more. Super cute for grandchildren. It would be great for the scarf to have the mittens built in so they cannot be lost. That chenille scarf is fascinating! So want to make that! I love finding new ways to wear scarves, and they make such great accents to outfits. It’s nice to know this book has lots of scarf ideas – for sewing and using. I have fabric to make a couple of scarves, and also for making a few shells. Supercool design and suggestion.I love sewing and this would be really great to have my own creative scarf.By different material and style i would like to opt for Fleece Scarf Ribbon and Big pocket scarf.Also Shirred is nice option. I am looking forward to making a chenille scarf in the near future. Thanks for all the ideas. Would love this book, mainly because I have never made a scarf. Have watched one of Nancy’s shows on this tho and think it would be fun for making gifts. I love wearing scarves. I like the infinity for myself but would love to make the childrens muffin scarf. I am glad Nancys blog is still going and strong. Nancy Zieman will be in my heart Dec 16 just as she is so often in my thoughts. Would love to see her tribute presented on PBS. I’ve already made the infinity scarf with good results; now on to the spiral – it looks great. Thank you team Nancy. more. The scarves in the book would give me many styles from which to choose. Thank you for keeping her life’s work going. I love infinity scarves so that is what I would make. Thank you for the giveaway. Would love to make the pendant scarf. Unfortunately will not be able to attend open house but would love to see the set. Nancy will be greatly missed. Nancy’s infinity scarF would be my first choice. But I wI’ll plan to make more. Would love to win the book. Just got to FL, or I would be attending the open house in Madison. I would sew the cowl infinity. All the scarves are lovely and would make nice Christmas presents. The spiral scarf is interesting, would love to try it. I live in Alabama so visiting is not possible, but would love to come. I love the infinity loop scarf, but the chenille has me intrigued. What a great resource for sewing scarves! I would like to sew many of the styles, and I would start with an infinity one. Regretfully, I am unable to attend the Open House to honor Nancy. Thank you for inviting her fans to share in her memory. I would love to make the Lettuce-Edge S-Curve Scarf for holiday parties. I love that fleece scarf with the attached mittens! The infinity scarf would be my first choice then a fleese scarf for each of my granddaughters and maybe for my grandson as well. Hope the open house goes well, wish I could be there. I would love to make the infinity scarf. All of Nancy’s scarves look so exciting. I love that you are keeping Nancy’s legacy alive–she was such a special lady. Just give me a scarf. I wear them to protect my neck in the winter. My grand daughters always love it when I make them scarves. The infinity scarf is so popular now. I have such a short neck (to go with my short body), I seldom wear a scarf except for a couple winter ones that my daughters made me. I really wish that I could attend the Open House to celebrate Nancy. I live in Arizona, and it’s just not possible. I still find it hard to believe that such a lovely lady is no longer with us. Definitely a scarf person.Watch your show each week.Looking at soft wool fabric for a triangle scarf.Would love to have the book. The Continuous Loop Scarf is the one I would like to make. I have not made the bias scarf and is one i would like to try. Thank you for bringing it to my attention and opportunity to still see Nancy in action. I made an infinity scarf once and I plan on making a fleece scarf for a present for someone. My tribute to Nancy will be to continue to sew and share with others as Nancy did. Thanks, Nancy and team for what you gave. May her legacy continue by inspiring us all to be not only better “sewers” but also better people. I will be teaching my daughter-in-love how to sew; this will be a perfect first project! I would love to sew an infinity scarf, then try some others. Her patterns always turn out well. I love the spiral scarf, have made several as gifts and have two cut and ready to sew for me. The Chenille scarf looks like a great one to make. I have a “tired” winter coat that needs a splash of color. I am planning to make a twisted infinity scarf. Thank you for allowing us to be part of Nancy’s legacy. I teach teens to sew and the infinity scarf has been a popular scarf for beginners to sew. Some fabric choices are a bit more difficult than others, but usually the students are up to the challenge. I have quite a few family members who would love to get a scarf for a Christmas gift! My first choice would be to try the Ribbon Scarf and then try the Ruffled Scarf. Yet, so many of these scarfs look so gorgeous, I know I would have a fabulous time making them all. Thank you for the great chance at the magnificent give away! Have a great day! I love the look of the continuous loop scarf. Would like to try it. Nancys legacy lives on!!!!! Thanks for more inspiration and projects. I have made many of Nancy’s twisted infinity scarves. Gave a lot of them as gifts. I would love to try the spiral scarf & the chenille scarf. Thank you to Nancy’s staff for keeping her legacy alive.